Roofing 85262 services with Triangle Roofing LLC. will foster a craftsmanship quality roofing system. As a result earning a Lifetime of protection for your roofing 85262 investment. More so its an investment for future generals to come. While our craftsman specializes in all types of roofing 85262. Since systems covered by our pro installation team Metal ,Tile, Foam and Roof coating. Further more licensed, bonded and insured. Insuring Triangle Roofing’s work is covered with a workmanship guarantee. Have full confidence Triangle Roofing LLC serving your 85262 roofing needs. Your roof and gutters are in good hands. New roofing applied under our guaranteed against leaks from natural causes for a period of five (5) years. Up to 20year manufactures guaranty on tile underlayment In addition depending on the type of roofing application you choose, the manufacturer’s warranty will apply. More so Triangle Roofing LLC will include all warranty paperwork ready for you to mail to the appropriate manufacturer upon completion of your roofing project. For your protection, please be sure to use licensed and insured contractors for work on your property. Roofing companies working without liability insurance and workers compensation. Can be risky and expensive if the job is not handled correctly. A company operating without liability insurance deems the customer responsible for any damages to their home or other personal property as a result of contractor negligence. Hiring contractors without workers compensation may result in litigation for the homeowner, should a worker become injured while on the job. Trust Triangle Roofing Company to foster the highest standards of work ethic, integrity, honesty, and professionalism. 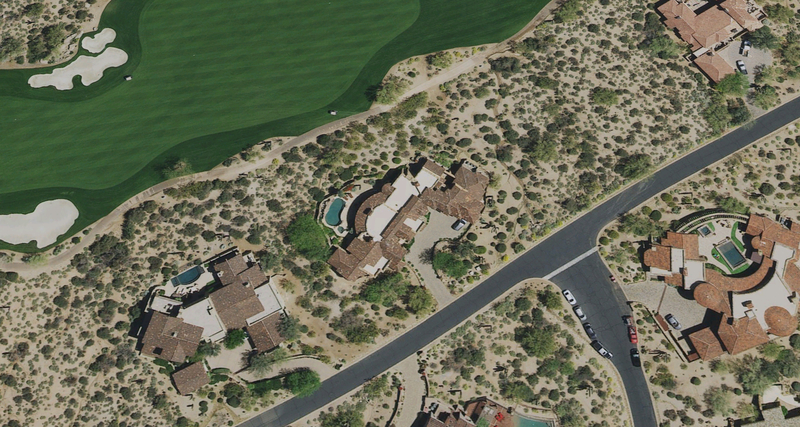 This roofing 85262 project is located in Desert Mountain Saguaro Forest with Rusty metal, tile, foam and coating. Roofing Membranes protect you during an extreme hailstorm. Rarely will you need your metal roof inspected after a sever hailstorm. A metal roof is a sound investment and adds beauty and value to a home or building. Long lasting and backed with an equally long warranty. However roofing membranes should always be inspected for hail damage after sever storms. Cost effective as they can be installed over old roofing and save on tear off costs incurred while replacing the existing roof with some other type of roofing. Providing a protective fixture that does not split, gather mold or warp unlike asphalt shingles or other membrane types of roofing. Highly durable and are able to withstand extreme weather conditions like heavy snow, hurricane force winds, wind driven rains and extreme heat as well. Metal roofing systems are available in Copper, Brass, Zinc, iron, steel or aluminum. Formed into standing seam, shingles or panels the durability (added protection during a sever freeze). Makes it an ideal roofing material, with the highest viability in the commercial sector. Manufacturer of metal roofing reap huge profits, as the demand is high for these products. Metal roof free inspections for hail damage… The inspection is free check for hail damage today. Roof leaks are a nuisance for many homeowners. More so can be difficult to diagnose – that is a fact. To make matters worse, different weather conditions will produce leaks in different locations. While the vast majority of roof coverings operate using the principal of gravity. This can be a big help in locating a leak source. However, horizontal roof boards can trick you. A leak may actually be eight to 10 feet sideways from where you see the wet ceiling or spot in the attic. Finding the source of some leaks is easy. Others will require detective work and possibly a garden hose and an inside spotter. Sometimes this can be as hard as finding the smallest leak! Here are some tips that may help you find a pesky roof leak: Don’t leave the hail damage to your roof unchecked call for a free hail storm inspection report today. Sprayed Polyurethane Foam is applied as a liquid using plural-component spray equipment to fill cracks and crevices. It then expands approximately 30 times its original liquid volume to form a hard, closed cell monolithic foam roof surface. Polyurethane Foam dries within seconds after applied to the roof surface. While expanding in to a weather tight roofing membrane that is fully adhered to the substrate. While Polyurethane Foam has a history of more than 35 years as a maintainable roofing medium. Polyurethane Foam adds excellent insulation value to the structure and utility bills can reflect the difference. SPF foam applied to the proper thickness and finish specifications. Topped with a protective layer of elastomeric coating. Creating a protective layer that’s durable weather resistant surface durable fro normal maintenance. Quality Maintenance Programs renewed yearly monitors your roof so you can focus on other issues that require your attention.